Aurora was up for a visit this weekend. 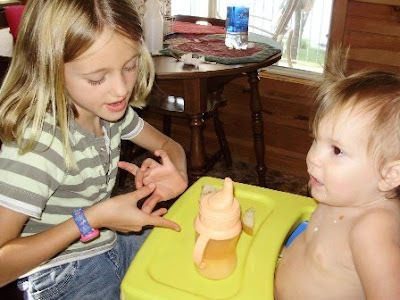 Her mother bought her a new doll that came with a bottle and a soother. Aurora loves this doll instantly knew she wanted to feed the baby her ba ba. So now she drags 2 dolls around, one under each arm. It's a little hard to manage going up and down the stairs so she gladly accepts assistance. Aurora had a little haircut this week and her sparse little pony tails are filling in nicely. She is the daughter of a hairdresser and she stands really good while I put the pony tails in. I couldn't resist taking a picture. Last month we got rid of an old washer dryer from our bathroom at the cottage. It came with the cottage but we didn't ever use it. Laundry gets dragged home. 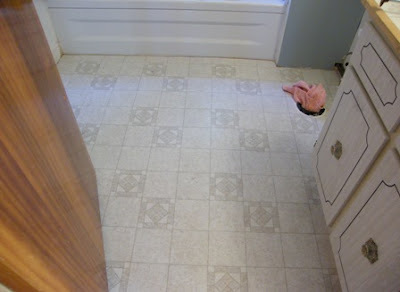 Getting rid of the old laundry pair not only gave us much needed storage space in the bathroom, but revealed bad holes in the flooring. 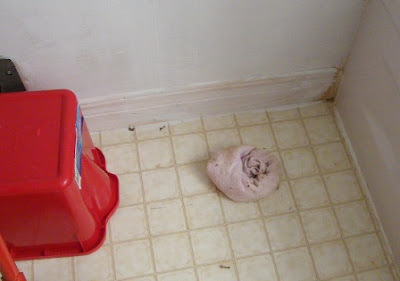 And a few years ago, we stuffed an old towel in the dryer vent hole and covered it with a bucket. So all this was a great excuse to plan a mini makeover for this bathroom. During the past week we gathered all the supplies we could think of. A hardware store is an hours drive away, so you don't want to be at a standstill on the project because you didn't bring a scrapper or something. And this past Saturday my hubby and our handy SIL installed the new piece of flooring. Don't they look happy about it!! Measuring and cutting in and around little nooks and crannies took a fair bit of calculating. But it fits really well. After all the fitting, the gluing and sticking down goes pretty quick. 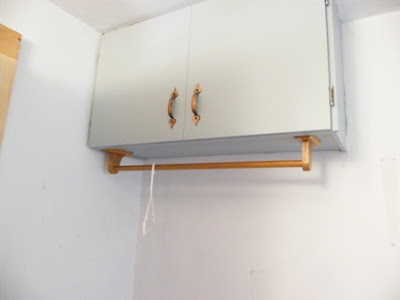 Earlier, we had painted a little upper cupboard and hung a little towel rod that will serve as a closet to hang a few clothes. Closet space is at a premium at the cottage. 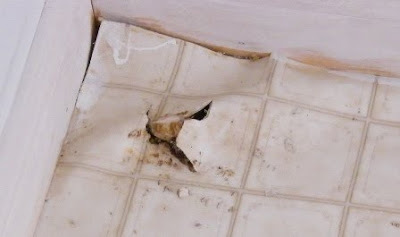 We removed some open shelving that held a hodge podge of mis-matched beach and bath towels. We purchased a tall storage cabinet with shelves and doors to store towels, and all the paper products needed around the cottage. 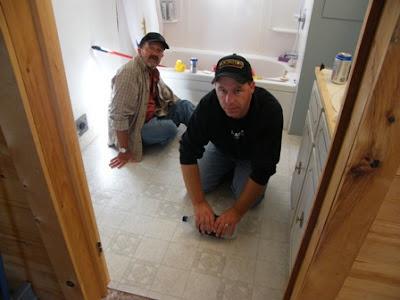 Since we plan on having the plumber in to close down the cottage next week, we'll get him to re-install the toilet at the same time as the shutdown. So that means I'll probably only get a good picture of the finished bathroom in the next week. 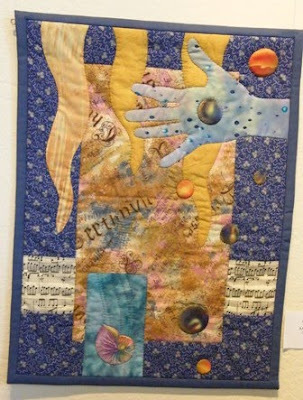 Our quilters guild has started up for this year, and sadly I missed the very first meeting. I heard it was fun and I even saw a few pictures. 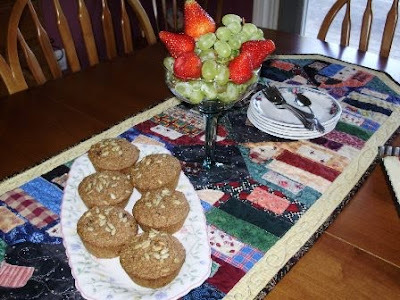 But I was soon further enlightened because our quilt guild has a new blog. 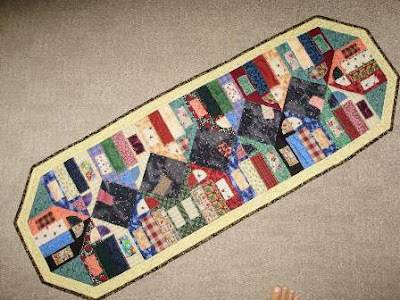 My buddy Linda H. put details of the quilt meeting on this new guild blog. Yippee. Actually I knew about this new FQG blog because I did the prototype early in the summer and the guild executive liked it and decided to implement it. So, my friend Linda H. agreed to help me with putting up some content, that would be interesting to our guild members. But what I didn't know is that this would be so informative to me. My travel schedule has me away for several of this years meetings so I look forward to a recap and pictures of what I missed and to be updated on the other events around the area. 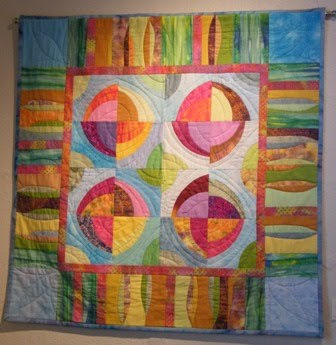 We have put up 2 galleries on the blog sidebar that feature quilts from our last two quilt shows. Have a look through them. You'll be inspired. 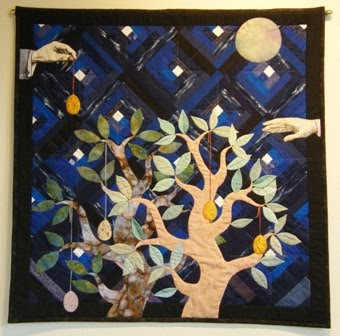 I hope our fellow guild members get used to visiting this site for their quilty fix. If you think the blog is nice or have suggestions for content, we would love to recieve a comment. Sunday - Oct. 4th - Who are you running for? I can't believe how quick a year has gone by since I last did the Run for the Cure. When I was working, I used to be an avid, ardent, committed volunteer for a few organizations. You know what they say, if you want a job done, get a busy person to do it. Well, since I've finished work, I can't seem to find a suitable steady volunteer job. This is mainly because of frequent traveling, personal care (exercising) and some fun stuff (coffee breaks with the girls). Besides a bit of volunteer sewing, quilt guild work and some odd babysitting, I don't do much volunteer work now. 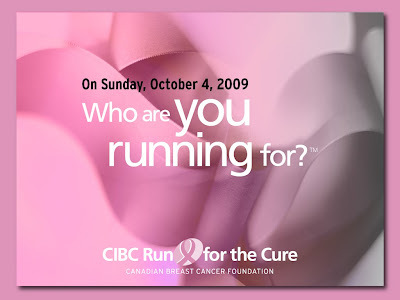 But one thing that I DO work into my schedule, is the CIBC Run for the cure, which is held each fall. I can't tell you how emotional it was, that very first year that I did the run. The run was in the afternoon. My sister was running the same run in Halifax, but it was the morning. She called me all excited that she "did" it!!!. She couldn't believe how emotional it was on many levels. See it was our first year actually running and it was an accomplishment for the both of us, even though in separate cities. I understood her excitement in finishing the run, but didn't quite understand the emotion. Well, an hour or so later when I got to the site where people from all over were gathering for the run, it was a sea of white and pink shirts. Most of the participants had paper's pinned to the backs of their shirts that said "I'm running for"... and the participant hand wrote in big letters who they were running for. For an hour preceding the run, it was hard to hold back the tears, as I read the signs on the backs of everyone's shirts. I kept thinking, that poor girl - lost her mother, or her sister to Breast Cancer. I did my run, and I too was elated and feeling really good. Now I understood what my sister was telling me. Anyway, I'm just getting all teary thinking about the 3 years that I've participated in this run. This a powerful event that helps bring education, awareness and continues the research into better drugs and treatments. And most of all, hopefully a cure some day. Will you think of me on Sunday, October 4th? I'll be wearing a white run shirt, and running for those in Pink! Many thanks to those who help me reach my small goal. If you would like to donate it's easy, just go to this link. You will be e-mailed your official tax receipt and I will personally send you hugs and kisses. Last month, I mentioned in this blog post that I ordered the Rainbow Lollipops quilt pattern from "Don't Look Now". 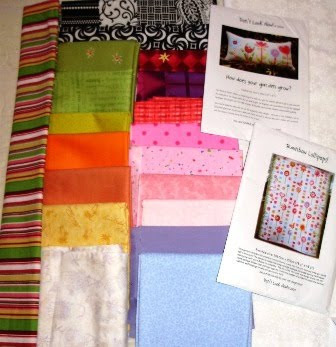 I also won the pillow pattern in one of her blog give-aways. I received both patterns a couple of weeks ago, so last week I started bringing a collection of fabrics together to start this cute cute quilt. I need a few more darker pinks, and I'm ready to roll. Well, not really. I probably have a couple of hours of tracing template pieces onto fusible, and then cutting them out before I can start sewing, but I'm excited to start anyway. I'm sure this will take me a few months to finish, but I'll post you on the progress every month. Grace is having a hard time this week. In addition to losing a tooth at school last week, she fell and broke her thumb. They didn't put a cast on her thumb because it would be cumbersome, so Grace came over and we made a sling to put her hand in. She has to be very careful not to bang her thumb because it could disturb the setting of her thumb. 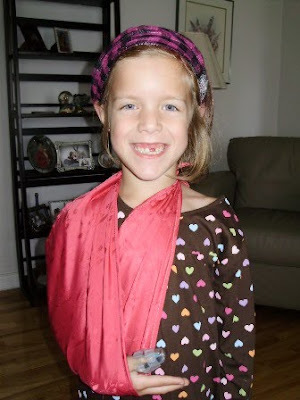 This picture was taken the day before she lost her second front tooth. Now she's all set to have her school picture taken. What a fun memory this will be when, years from now, we all look at her Grade 2 picture and wonder how hard life is when you are seven. Before going to Bermuda, I checked on google to see if there were any quilt shops there. I did find reference to a quilt guild that has about 50 members, but no quilt shops. They must buy their quilt fabrics online I guess. 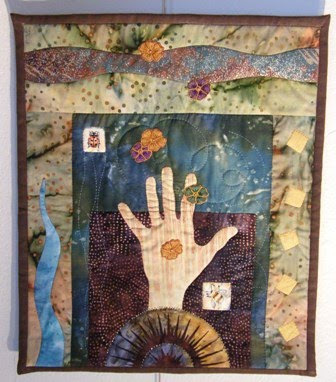 So when I got to Bermuda, I was pleased to stumble upon this one woman's quilt art display at the local Art Center. Her name is Lynn Morrell. I think this blue themed charm wall hanging was one of my favorites. 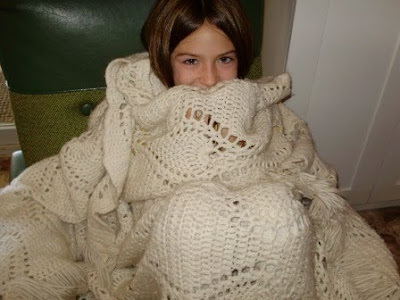 You can see she quilted it using various motifs that are very effective. Have a look at some of her other work below. I like this quilt as well, it's so colorful and these colors really look like the different colors of the houses I saw in Bermuda. Lots of soft candy colors. 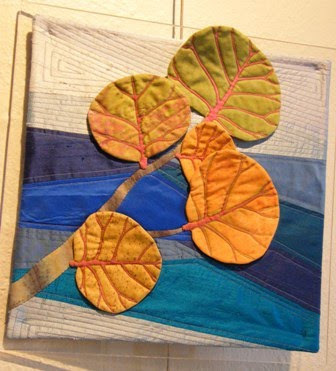 These 2 small quilts were mounted on glass and hung on a string from the ceiling. 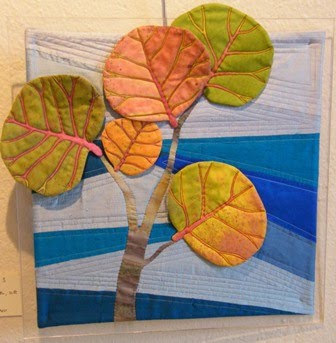 I loved the dimension of this quilt, and yes, these look like some of the native plants in Bermuda. 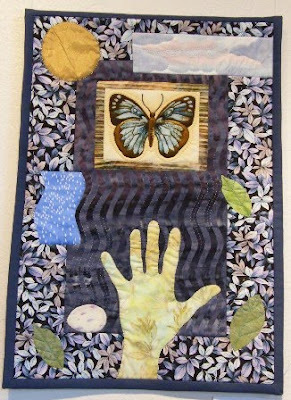 The rest of these quilts look like they are part of a hands collection. I didn't notice any artist statement that explained all the hands, but I'm sure there was a story. Many Thanks, Lynn Morrell, for giving me my quilt fix while in your Beautiful Bermuda! 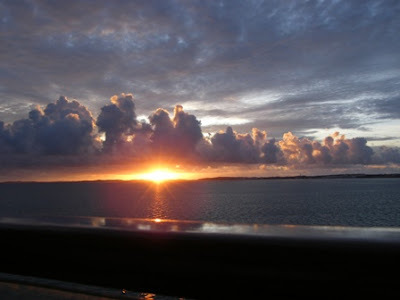 As the sun rose, our ship is preparing to leave Bermuda. What a beautiful island. We covered it all. Beaches, shopping, ferry and bus trips. We're now en route back to Boston and will arrive first thing on Friday morning. We'll be driving back to NB and arrive home after supper. We've docked safely in Bermuda. The first day of sailing was a bit rocky as we sailed the Atlantic. The more south we got, the smoother the sail. We're here now on the island, and it's very nice. No talk of the triangle around here. I'm not sure if it's an insult or not, but everyone here is very classy and very friendly. It's a very warm day today and we're on foot touring all the properties around the wharf tip of the island today. And we'll tour the rest of the island by bus and ferry in the next 2 days. There's no Sunday shopping here in Bermuda except for the touristy places. It doesn't seem so long ago, that we never had Sunday shopping in NB either. Seems strange, but it's nice to have a quiet day to get familiar with the island. Did you know that they have some of the Top 10 beaches in the World here in Bermuda? I think we're going to try to visit one tomorrow. Look what is on the menu this evening. Today, we're packing to go on a light vacation. Light because we're driving to Boston and not flying. We don't have to worry about the fuss of packing properly and avoiding aerosol cans, removing nail files, manicure stuff out of our carry on, and purses etc. When we get to Boston on Friday morning, we'll be heading to the cruise port and boarding a ship around noontime and will set sail to Bermuda around 4pm. When we get there, it will dock for 3 days and we'll be touring the island on our own. We've flown over Bermuda a few times, while en route to a sunny destination, and we always said, if we get a chance to go there, we should. So, we are. I'm going to try to do a big of blogging while there next week - Sunday, Monday and Tuesday, so keep an eye out for updates later this week. 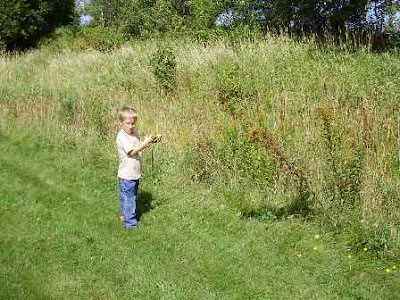 What a great time Mitchell and I had as we were out looking for his very first geocache. 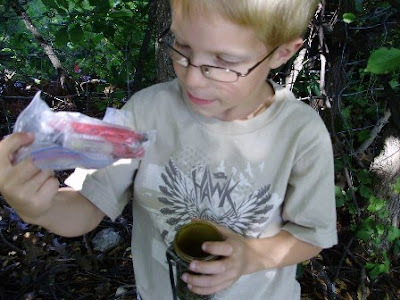 We found a nearby cache on the geocache website. 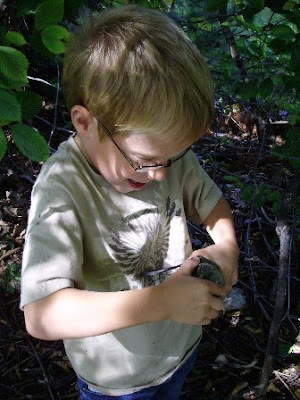 I programmed in the coordinates into the handheld and Mitchell carried the GPS and followed the arrows. Smooth sailing so far. Walking in an open field. 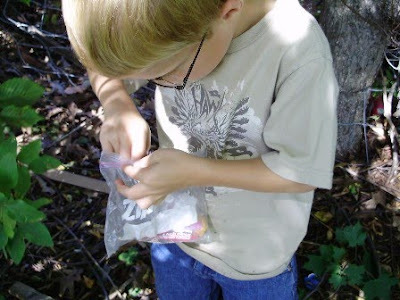 We're at the cache coordinates, now the search begins. 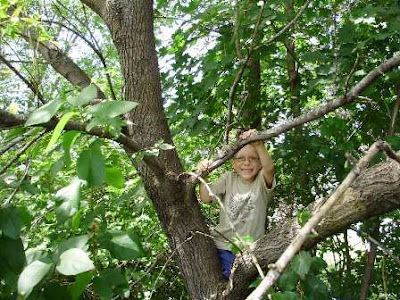 We're in the thicket and it's good thing that Mitchell can climb a tree because I can't. We look, and look. Up and down every tree in the area. No cache yet. This is hard work. 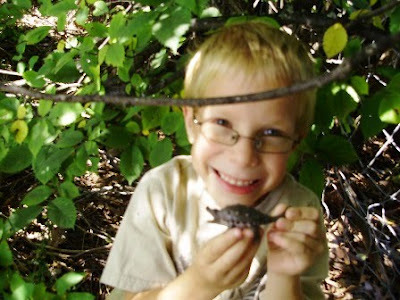 Yippee, Mitchell found it. It was camouflaged so good that we passed by it several times. Do you see it in this picture? It's there... look hard. And finally, he gets in. The package is in a sealed plastic bag. The contents are amazing... a list with previous finders of the geocache, a pen and a couple of trinkets. 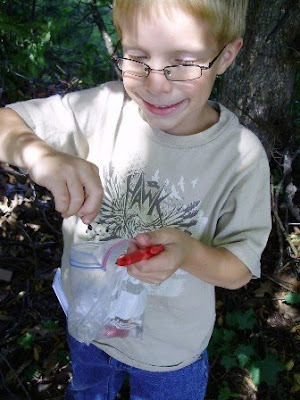 Mitchell signs and dates the list of finders of this cache. He puts in a little dog as a trinket. And removes a fun little amphibian trinket for himself. 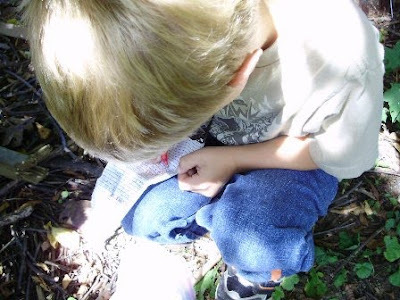 We close up the cache, put it back safely where we found it, and walk home with lots of chit chat about our find, and where our next cache will be found. 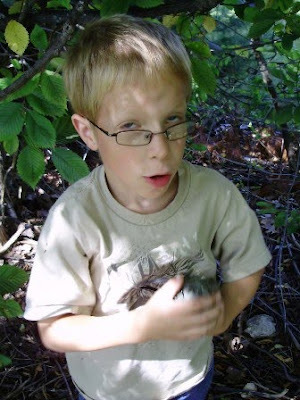 Geocaching - A fun afternoon for Mitchell. Emily is teaching Aurora all about Itsy Bitsy Spider. I think Jessica got too much sun this afternoon at the cottage. Brrrr, she needs to warm up. 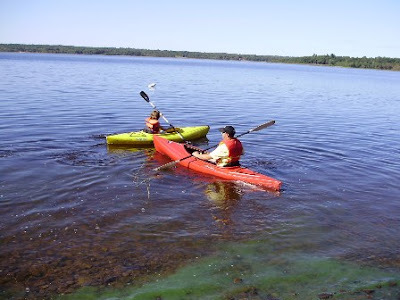 Jessica and her Dad going for a paddle in the Kayaks. 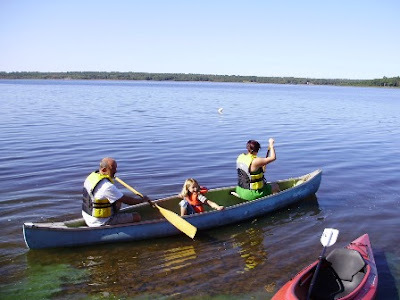 Grampie and Patience are taking Emily for a Canoe ride. 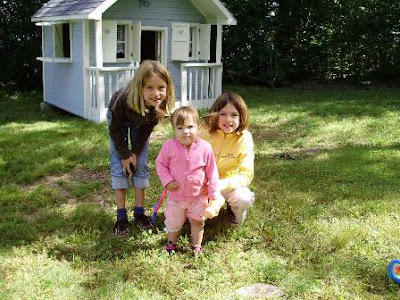 All the kids love playing around the yard and the kids cottage has a fresh coat of paint. And the sunsets are beautiful. 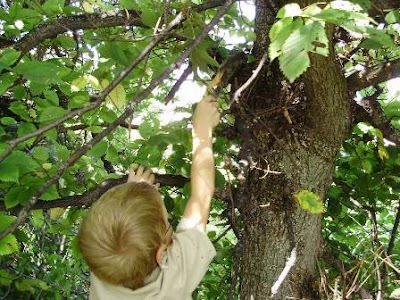 The warm days and cool nights are a reminder that the fall and winter are approaching fast. 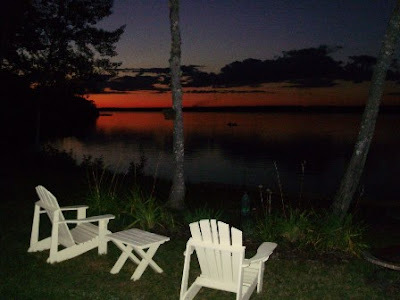 The number of weekends we have left to go to the cottage are few. I started this scrappy table runner in the late spring. It's actually a prototype for a project that the Friday Girls and I are working on this fall. It's a pattern from "Stitch and Split Applique" by Jayme Crow and Joan Segna. We were so inspired when one of our own Friday Girls had made one and when we went to her house for coffee, it blew us away. It was just so nice. So, we're making houses and swapping prepared houses before continuing on with the finishing of this project. You can see some of my batik houses here. I learned a lot by doing this prototype and I won't be making those same mistakes when we do the good batiks table runner. 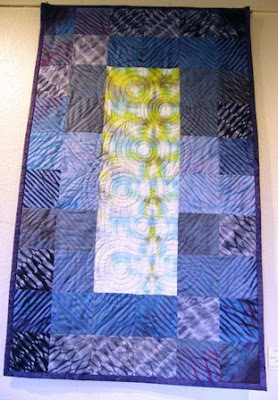 Today, I layered, machine quilted and bound this piece. I really like the finished runner and it will be on my table when the Friday Girls come for coffee tomorrow.